When designer Yuri Okamoto first started studying bag-making, she probably didn’t imagine that her designs would one day provide jobs for rural Vietnamese women and help divert waste from landfills. But that’s exactly what KISSACO, her “smile-creating business,” achieves today. Inspired by her travels through rural parts of the Philippines and Vietnam, Okamoto upcycles hemp sacks used in coffee bean collection to create waterproof and stylish handbags for all ages. These high quality and durable bags provide not only income for Vietnamese women during the rainy season, but also a lesson on the value of recycling materials. 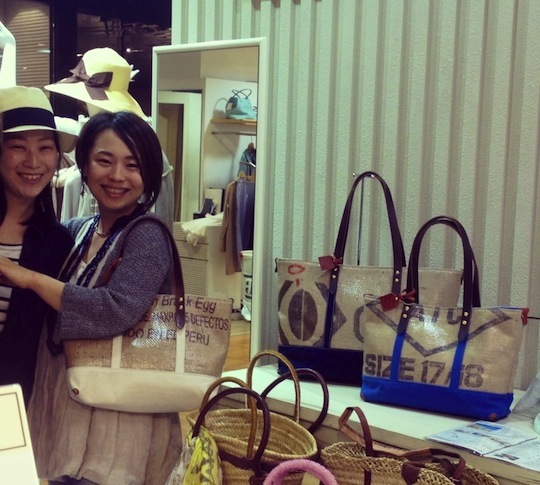 Yuri Okamoto depicted on the right with her handbag collection. Yuri Okamoto posing with Vietnamese children. Inspired by her travels through rural parts of the Philippines and Vietnam, Okamoto upcycles hemp sacks used in coffee bean collection to create waterproof and stylish handbags for all ages.